It is important to meet these deadlines, because late payments will incur penalties of 1% for the day after the due date, 4% for seven days later and an additional 1% for each month the tax remains unpaid. 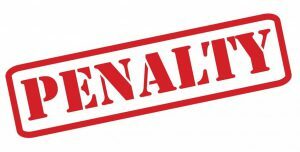 Therefore no penalty should have been incurred for provisional tax payments made on 16th January or 8th May because this was the next business day. However, we have seen that occasionally the IRD has mistakenly charged the 1% late payment penalty. Please be aware that this can happen, and if you are not sure if you have been charged a penalty in error earlier this year please contact us and we can check this out. If you have been mistakenly charged a penalty, we can raise a query with the IRD on your behalf to have this reversed.